By design, tuition covers less than 80% of the cost of educating each student at St. Andrew’s, keeping tuition lower and within reach to more families. An excellent education requires funding beyond what tuition provides. We do not receive the governmental financial support typically afforded to public school districts. St. Andrew’s Episcopal Academy relies on Annual Fund contributions, endowment income, and other fundraising efforts to meet operational expenses and funding priorities. Your gift to St. Andrew’s ensures that we are able to sustain our mission for generations of students to come. When your child attends St. Andrew’s Episcopal Academy, he or she becomes part of the St. Andrew’s family. A partnership is created between the school, parents, grandparents, teachers and staff. That partnership lasts a lifetime. You may make a pledge and make payments over the school year or do a one-time donation. Annual Fund donations are 100% tax deductable. At St. Andrew’s Episcopal Academy, we have events throughout the school year that offer participation at a variety of levels. Events aren’t just about raising much needed funds, it helps us engage our community and create awareness about our school Whether it’s serving on an event committee, sponsoring an event, or simply attending, your efforts make a big impact. Make a personally significant gift, often larger than he or she thought possible. Enjoy the satisfaction of providing the means for St. Andrew’s to fulfill its mission. Save on gift and estate taxes. Reduce or avoid capital gains taxes. Pass assets on to family members at reduced tax costs. Possibly receive income for life. For more information about Planned Giving, contact Rhonda Blakey, Director of Community Relations & Fundraising at 772-461-7689. 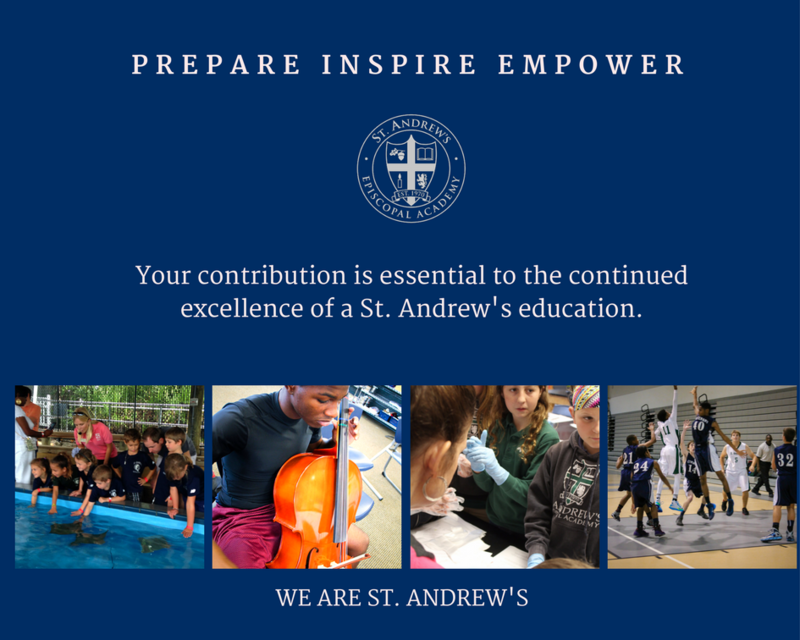 The world class education experience that students receive at St. Andrew’s Episcopal Academy would not be possible without the support of St. Andrew’s families and our community. Your gift, large or small, is deeply appreciated and makes a tremendous difference to our students. The impact you make today will allow St. Andrew’s students to develop themselves in mind, body and spirit. Create the leaders of tomorrow with your gift today. ST. ANDREW’S EPISCOPAL ACADEMY IS A 501(c)3 FLORIDA CORPORATION. DONATIONS ARE TAX DEDUCTIBLE AS ALLOWED BY LAW. A COPY OF THE OFFICIAL REGISTRATION AND FINANCIAL INFORMATION MAY BE OBTAINED FROM THE DIVISION OF CONSUMER AFFAIRS BY CALLING TOLL FREE (800) 435-7263 WITHIN THE STATE OF FLORIDA. REGISTRATION DOES NOT IMPLY ENDORSEMENT, APPROVAL OR RECOMMENDATION BY THE STATE.